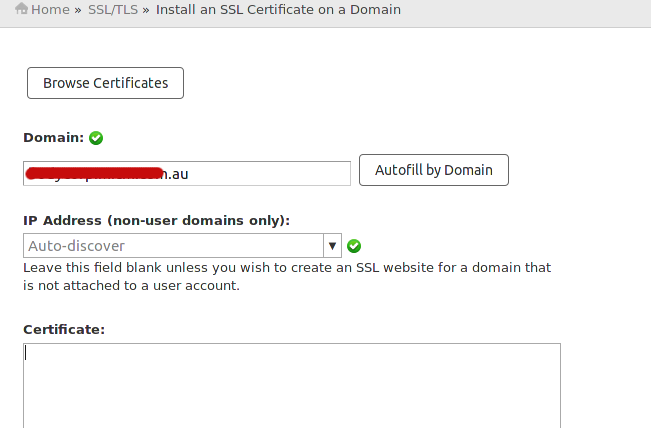 Once an SSL certificate is issued, you can install it on your domain using the WHM control panel installed on your Web24 server. Note: For cPanel versions up to 11.38, you will need to assign a dedicated IP address to your website to install an SSL certificate. 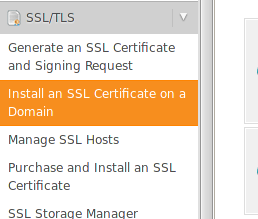 From cPanel 11.38+ onwards, SSL certificates can be installed for a websites hosted on a shared IP addresses. Login to Web24 control panel by going to http://admin.web24.com.au. When you enter the complete domain name, the Auto fill by Domain option will appear next to the Domain field. Do not click Auto fill by Domain. Keep the IP Address field blank. Paste the Certificate, the private Key and the CA Bundle in the text boxes provided. If the installation is successful, WHM will display a message to indicate that the certificate is installed.